For a unique addition to your big event, hire a talented airbrush artist to create custom favors for your guests. On this list of airbrush artists in MD, we’ve found T-shirt artists, makeup specialists and face painters that utilize high-quality airbrush paint. 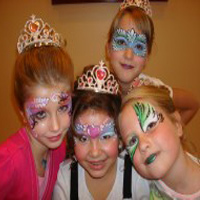 KidsParties.Party is a top resource for parents that also features airbrush artists for hire in Maryland. "You bring the face....we bring the fun!" - with this slogan, Fun Faces is serving airbrush events in MD. 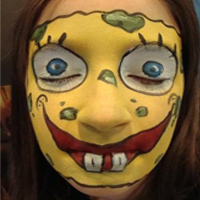 For your best face painting, you can always rely on Fun Faces. 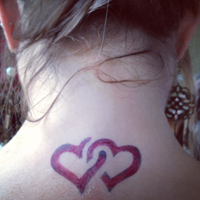 They are very prominent in the field of glitter tattoos, hand painted temporary tattoos, and henna art! Fun Faces have the best airbrush artists in MD. Being professional artists, they only use FDA certified and cosmetic grade professional products. Fun faces is not only a reliable organization but the products they use are safe. They have been serving for several years and earned a reputation for quality and professionalism. If you are looking for airbrush artists in Maryland, you can easily count on them! Big biz entertainment is a prominent name in the arena of airbrush artists in MD. They provide everything from stilt walkers, face and body painting, airbrush face art, living statues, living buffet tables, mimes and so much more. They are very experienced with big events. One of them is Awesome Living Statue for our Prom. It was done by Michael who is very easy to communicate and very timely. He came up with innovative ideas and he is very requirement oriented. Think about airbrush artists in MD, think about Big Grins. 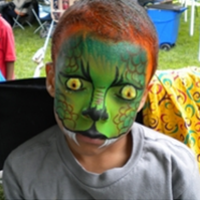 For a memorable experience with high quality face painting, glitter tattoos, airbrush face painting, airbrush tattoos, & balloon twisting hire Big Grins. They are the hit of the party time and time again. People transform themselves into tigers, kitty cats, princesses, super heroes, monsters, or whatever they desire. Guests excitably anticipate their time with the artist, guests love watching the transformation, and everyone delights in seeing the results and reactions. Adults get in on the fun too! Big Grins is influenced by an art and design background, Silly Heather, Lisa Joy Young, Mark Reid, Nick and Brian Wolf, Nix Herrera, and observing what is around. In the field of Airbrush Artists in MD, Ariel is a prominent name. Empowering women by making them feel confident, gorgeous, and comfortable in their own skin is the passion of Ariel. They do this by truly getting to know their client and understanding what makes her feel beautiful. Some women like the glamour of keeping their eyes as the focal point. Others love the elegance of a bold lip. Whatever you find makes you feel confident and beautiful guides them to achieve a look that is as unique as you are. They dedicate themselves to all of the above using the highest quality Airbrush Makeup and Luxury Hair Supplies available. They feel glad to help you look and feel your best for your next occasion! Spectacular artists and performers providing a variety of entertainment for every occasion. One of their specialties among airbrush artists in MD is amazing face and body artistry. Guests will be transformed right before your eyes into their favorite animal, a fairy princess, an exotic place, monsters, and more. Face Works Events can also do delicate and fancy eye designs. Other popular party attractions include festive balloon twisting, caricature drawings, craft activities, stilt walkers, jugglers, living statues, comedy magic shows and lots more. They also feature unique and customized balloon decor. They love what they do and they look forward to creating art, fun and smiles for you and all of your guests.